I’m sure you’ve seen the 3D sidewalk art photos that have hit every inbox at least three times in the last couple years. 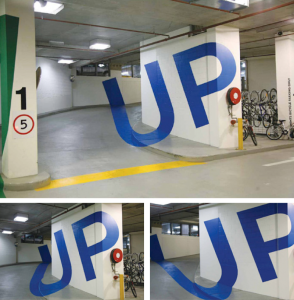 Axel Peemoeller has taken the concept of point-of-view dependent imagery and applied it to provide directional guidance in a parking garage. Check out all of the photos on his page documenting the Eureka Carpark he designed while at Emery Studio. I’d totally park here. Actually, I’d just drive in and out of it all day.